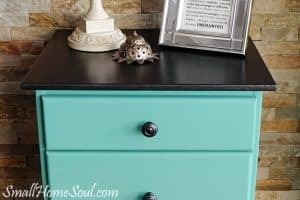 Mid Century Modern Milk Paint Makeover - Girl, Just DIY! 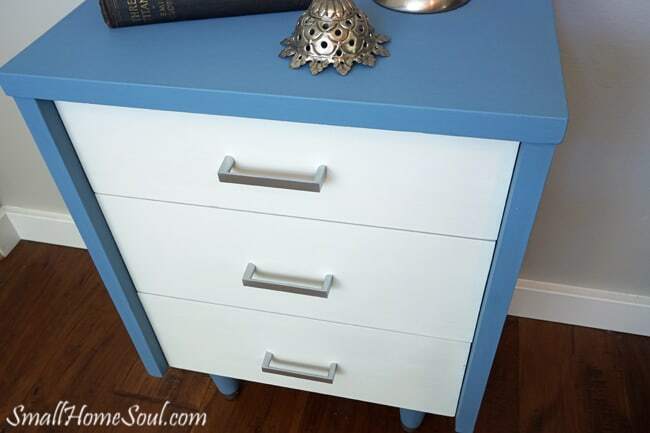 Hi friends, have you ever used Milk Paint? 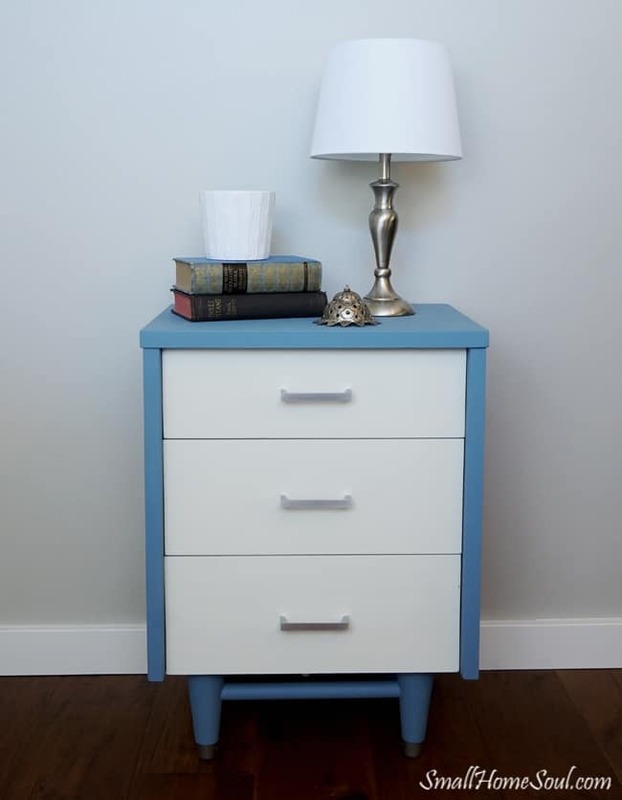 I have many friends who love it but I hadn’t used it until this week when I made over an ugly duckling of a mid-century modern night stand as part of a contest in the Fab Furniture Flippin’ Contest™ (FFFC) Group. 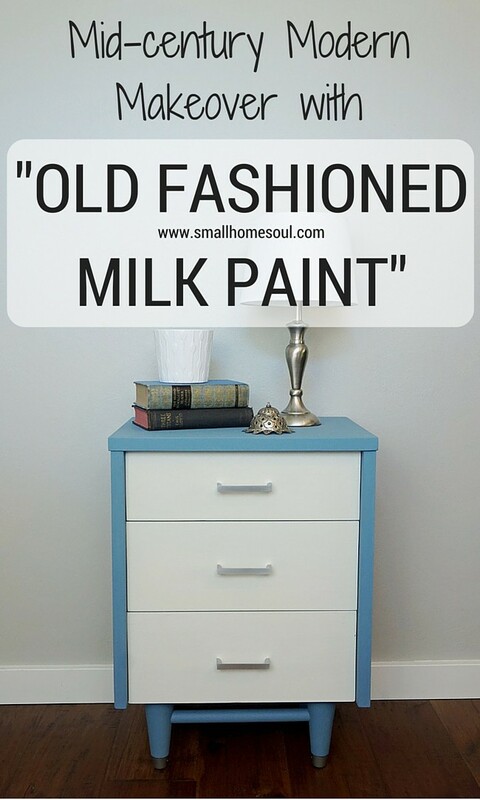 This month’s theme was “Farmhouse Fun” and is generously sponsored by Old Fashioned Milk Paint Company. They’ve used all natural minerals for 42 years to create paints which are low VOC and come in 20 classic colors. I had a hard time choosing but finally settled on Soldier Blue and Oyster White. You’ll also want to purchase their Extra Bond if you don’t want your finished project to chip. 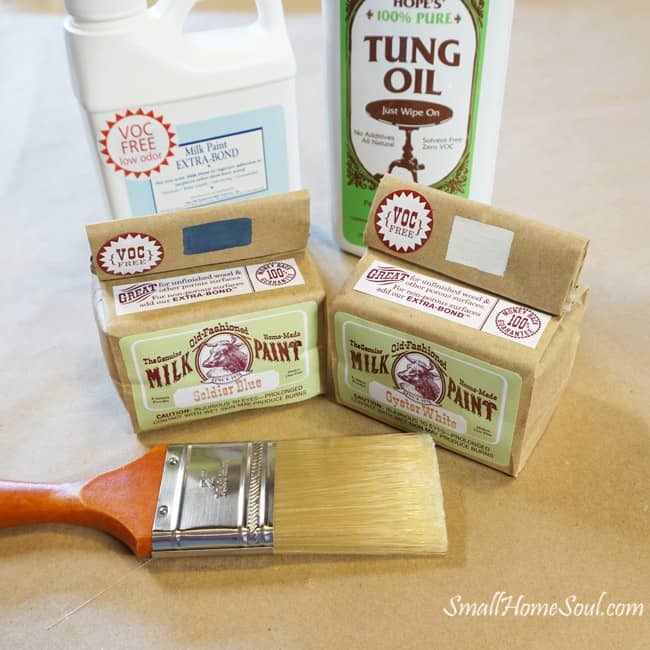 And you can use tung oil to preserve your beautiful paint job. Below are the items I received from our sponsors in exchange for this post review of their products. All opinions are, and always will be, my own. 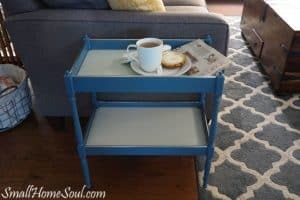 A few months ago I happened upon a garage sale in my neighborhood and bought a few side tables that have been in the way in the garage. I decided to use this mid-century modern table for this contest. It has a sad face which fit the condition perfectly because it had obviously been abused over the years. Some of the veneer was missing and needed repairing. I pulled away all the loose pieces and used DAP Plastic Wood to fill in where needed. Thankfully, this was the only spot where the veneer needed to be patched. I had to re-glue one small spot on the top at the back. While I was patching the veneer I also used the DAP Plastic Wood to fill all the knob holes. While it dried I made a template for the new drawer pulls. I took measurements and found the center and the correct placement of the pulls. I marked spots on the template I made from an old hanging file folder. Once I had it perfect I lined up the template to the corner of the drawer. Using my handy dandy Scratch Awl I made indentations for the drill bit. 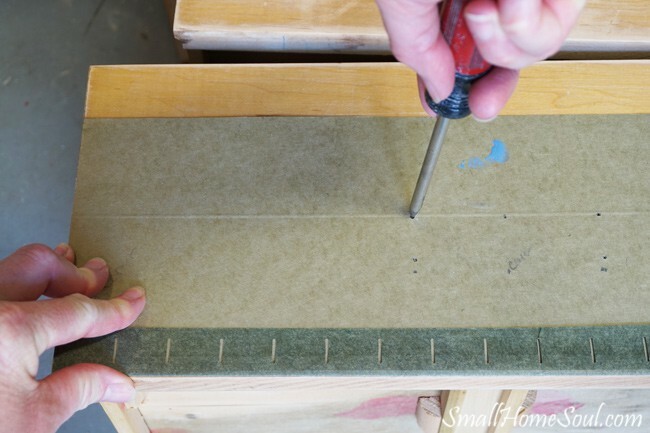 Using a scratch awl ensures the drill bit will be perfectly centered. I didn’t have much wiggle room with the pulls I chose so the holes had to be perfect. See the two black dots below? Those are the indentations from using the scratch awl above. Oh yes and all the lovely holes I filled with the plastic wood. Once it’s dry just sand it like wood, but it’s harder than wood which resulted in some heavily sanded spots. The legs were loose and needed some attention too. 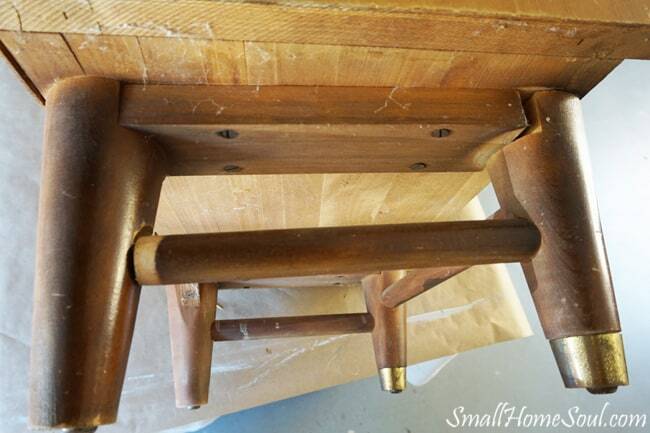 The dowel that held the leg to the cross piece was broken. I worked some wood glue into both spots and pushed it back together. Next I set it on the ground and drove a wood screw through the bottom of the cabinet down into the leg to secure it. After the repair work was done I sanded it all over to prep for the milk paint. 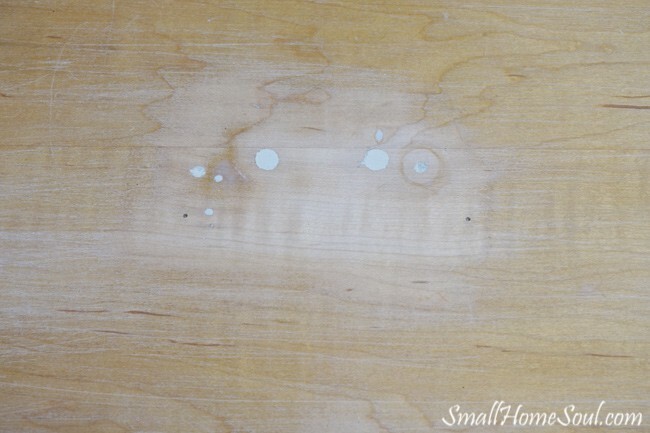 Sanding a previously finished surface gives it some “tooth” to which the paint can adhere. I mixed the Milk Paint in equal parts with warm water. The Soldier Blue was a bit too dark so I mixed in approximately 30% Oyster White powder (and equal water) to get a lighter blue gray. 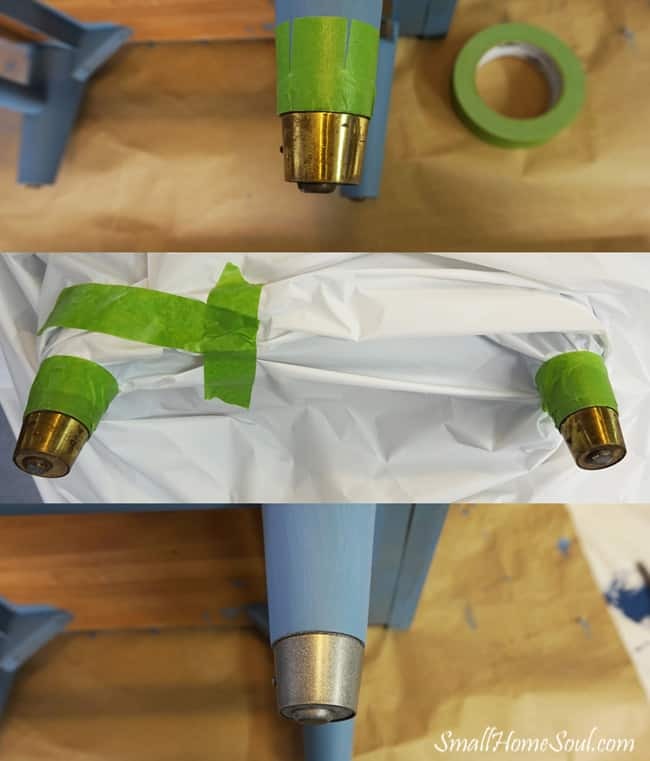 This was my first time painting with Milk Paint and it’s important to follow instructions carefully. I’m sure I didn’t mix the paint a full 2-3 minutes and even after letting it rest the suggested 15 minutes I had a few white spots show up in my first coat. Soooo, set a timer and save yourself some headaches. I have learned that using a Milk Frother really helps mix up your milk paint well and leaves no lumps. 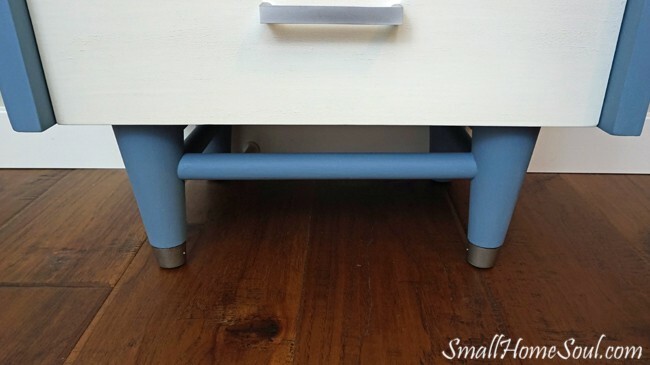 I mixed enough and added the Extra Bond to do the entire body of the nightstand with two coats. Extra Bond is important if you’re painting a previously finished surface and you don’t want chipping. Milk Paint by it’s chemical makeup will chip. I didn’t want it to chip. More on that later. After the body dried I tackled the sad metal feet on the front legs. 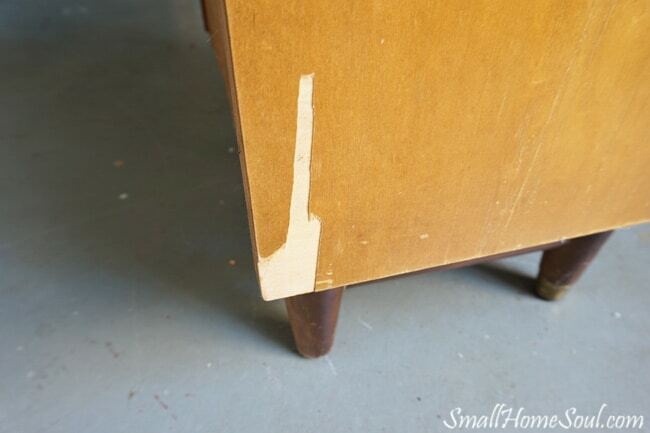 I used my trusted Frog Tape which I cut little slashes in to bend and wrap the painted leg. I also used a white plastic table cloth to cover all but the ends of the feet and sprayed them with a Rustoleum Metallic Paint in Silver. It’s such a beautiful improvement! 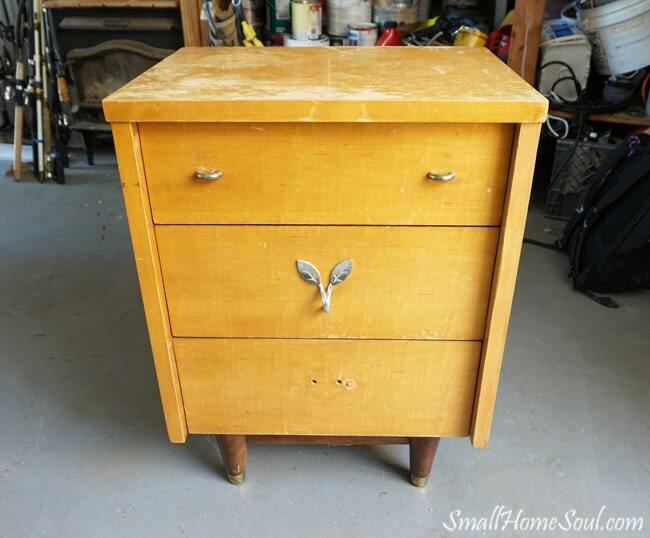 Remember when I said milk paint will chip? And I didn’t want it to chip? I also didn’t mix my oyster white correctly and may have added the Extra Bond too soon. The first coat on the drawers wasn’t great but after it dried it sanded up nicely with a fine grit sanding block. Phew, I think I dodged a chippy bullet. I tossed the first batch and made fresh milk paint for the second coat. The instructions stated that you only need extra bond in the first coat so I didn’t add it to the paint for the second coat. I should’ve added some anyway since I had plenty for my project. Here she is, finally, in all her milk paint “chippy goodness” glory. But first I’ll remind you of the sad-face before. And the awesome after 🙂 Mid-century Modern goes Farmhouse Glam! Here’s a better angle of the drawer pulls I picked up at Home Depot for $3 each. They’re square on the outside but curvy on the inside to contrast all the hard angles. Look at the sparkly new shoes on those little feet. And if you look close you can see the “chippy goodness” happening on the drawer. I’m glad I didn’t go into full freak out mode, because I really like how it turned out! I want to send a big thank you to the organizers of the monthly contests. It’s fun participating and getting to try out new products with the chance of being a winner. If you’re a blogger and would like to participate in a future contest send an email to info@fabfurnitureflippincontest.com. Until next time! Don’t forget to Pin! Hi Toni: I can see this in a little boys nursery. So bright and cheerful now. 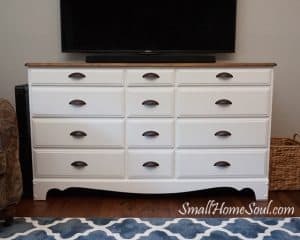 I love painted furniture and that is a beautiful piece. You did a great job! 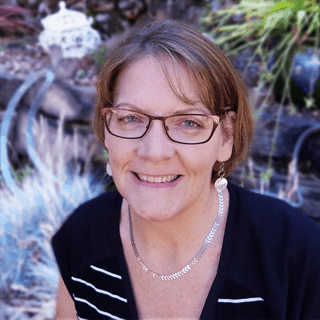 Thanks for sharing at the Family Joy Blog Link Party this week. Thank you so much Melissa. I really love it but sadly I don’t have any room for it in my house so I’m going to sell it. Toni that is quite the stunner. The beautiful blue color makes the piece stand out. Well, it was worth all the effort! It looks awesome!! Thank you, it was worth the effort. Hopefully someone will love it and want to buy it because I don’t have room in my house to keep it. Toni you did an amazing job! 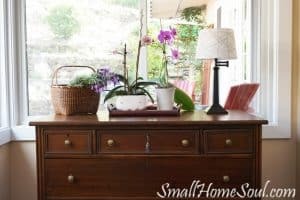 The burning question I have is…will you use milk paint again?